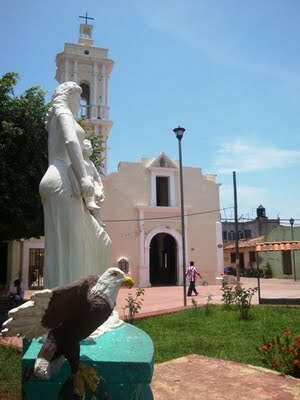 This June 29th, 2011, there's a special annual celebration named "A battle of the Saints at Mexcaltitan". There will be a representation of a battle between San Pedro and San Pablo to see who will be the founding saint and the cornerstone of the Catholic Church. This unique festival set in what is known as the 'Venice of Mexico' is very colorful. Shrimp-fishing characterizes this region, and the 'Saints' sail out very early, followed by a procession of parishioners from around the island to bless the waters so that the traps they’ve set get as close as possible to the three ton record per night that was set in the past. Click on this link to get a better idea of what the festival is all about. Mexcaltitan is located 21 miles northeast of Santiago Ixcuintla, approximately 1 hour from San Blas and 2 from Tepic.